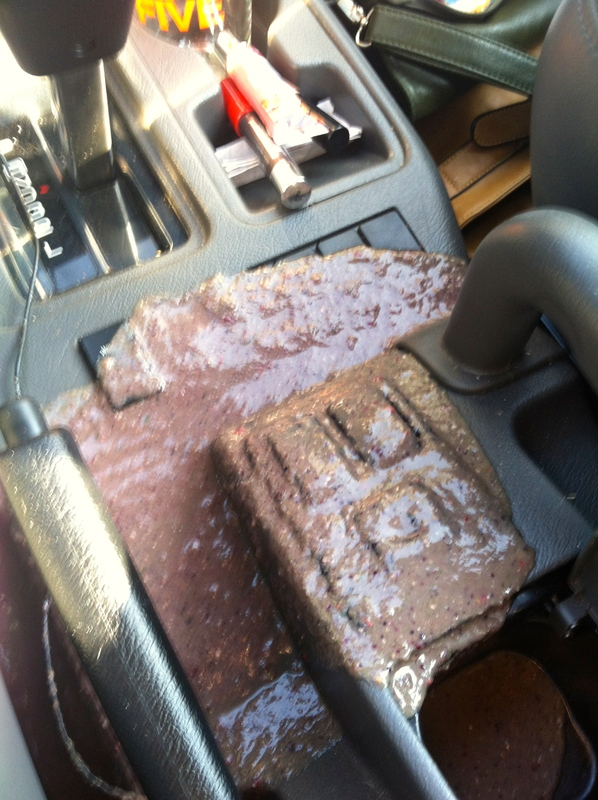 This morning I spilled kale smoothie all over my center console. Like, all over the center console. Its thick, nutritious, fruity semi-solid state oozing all into the buttons, down in the no man’s land between the seats and into my cup holders. When I looked down and saw it snaking its way everywhere it wasn’t supposed to, I simply cursed and kept driving, choosing to ignore it until I reached my destination. I just turned the radio up louder, sang more obnoxiously and pretended it hadn’t happened. Because the best way to live in denial of a spill that massive is to create more noise in the car. I used about 300 paper towels and kind of sort of cleaned it up. There’s still a lot more to do to remedy the situation, but that’s why one acquires husbands, no? Before the smoothie dumpage of ’13, I awoke fresh, having shaken off the vestiges of grill failure from the previous night. I had purchased grass fed steak burger and a luscious looking hunk of brisket at the Farmer’s market and was eager to serve DTH some rosemary citrus brisket fresh from the grill (we’re on week 3 of life without an oven, so unless it can be cooked on the grill, in the microwave on the floor or in a crockpot, we don’t eat it) alongside a kale salad with grilled beets, as picturesque as The Year In Food’s. But after roasting my non-baby beets in foil for nearly half an hour to find them hard as rock still, completely charring both sides of the three pound brisket before remembering that brisket, especially a cut as thick as the one on my grates, needs to be slow cooked, I was ready to throw in the towel. Davey simply came out to the deck with a glass of sauvignon blanc in his hand, calmly placed it in mine, pulled the tongs out of my hands, shimmied the meat to a resting place away from the direct heat, closed the grill and suggested we use the steak burger meat to make ourselves some, well, steak burgers. I sorrowfully agreed that would be the best bet, and while forming the patties figured out how to salvage my grilled beet salad. I removed the beets from the confines of their foil packets, sliced them in half, drizzled them with balsamic, and placed them directly on the grates. When I checked them 5 minutes later they looked like lumps of charcoal. As though detached from my body and emotions, I simply picked each up and set them beside the slow roasting brisket, went inside, sliced a couple peaches in half, put those where the beets had been, and moved on with my life. What came together for dinner was a far cry from what I had planned, but, you know, it turned out pretty dang delicious – especially after a second glass of that citrus-y wine. I didn’t think to take a picture (you know, especially after a second glass of that citrus-y wine), but recreate this salad for deliciously bountiful summer night greenery. Place chopped kale in a large bowl. Combine olive oil, cajun seasoning, kosher salt and black pepper in a bowl. Baste raw corn with oil and seasoning mixture. Place on hot grill. Also place poblano peppers on grill. Rotate peppers every few minutes until they’re blistered and slightly charred on all sides. Remove and set aside. Rotate corn every few minutes until desired char is on all side. Remove and set aside. Place peaches halves on grill, cut side down. Allow to cook for several minutes until soft with grill marks on cut side. Remove from grill. Slice corn of cob, and mix into kale. Remove as much skin as you can from poblanos, then chopped, and add to corn and kale. Chop peaches (we preferred big chunks) and toss into salad. Crumble desired amount of goat cheese into bowl. Toss in your favorite light-flavored salad dressing (we used blood orange olive oil and maple balsamic vinegar for ours, but a smoked tomato vinaigrette would have been equally delicious).